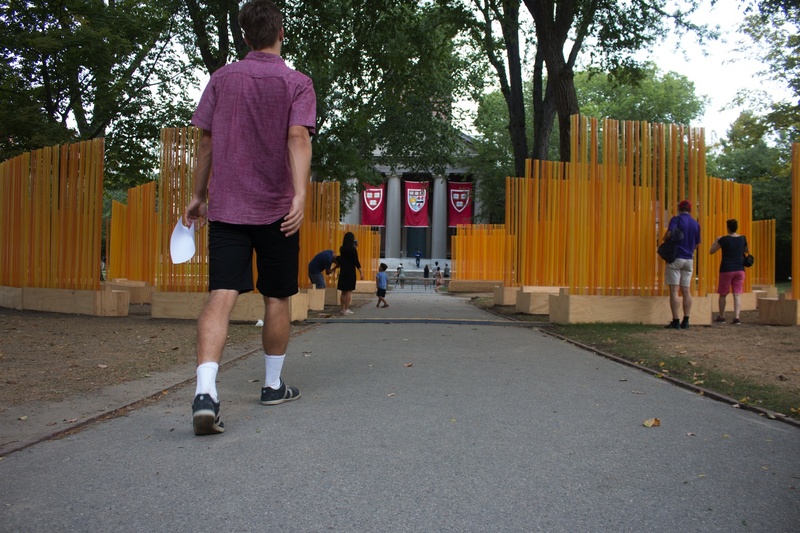 The Harvard University Committee on the Arts commissioned artist Teresita Fernández to create the sculpture “Autumn (...Nothing Personal)," which is inspired by a 1964 James Baldwin essay and will remain in Harvard Yard until early October. A recently erected art installation titled “Autumn (...Nothing Personal)” and inspired by a James Baldwin essay will remain in Tercentenary Theatre throughout the month of September, serving as a space for events, discussions, and public viewing. The Harvard University Committee on the Arts commissioned artist Teresita Fernández to create the sculpture. The installation comprises concentric rings of long, curved wooden benches with backings made of semi-illuminated yellow and orange tubes. Planning for the sculpture, which was fully installed in the Yard August 27, began two years ago. Fernández taught a course at Harvard entitled “Arts, Imagination, Democracy: Public Arts in Practice” in Jan. 2018 as part of the College’s Wintersession program. She wrote the course served as “preparation” for her work on the sculpture. “The students were involved from the beginning in thinking about what it could mean to imbue a built structure with democratic practices and research,” Fernández wrote. The project also drew on contributions from Harvard affiliates such as Amanda Figueroa, a Ph.D. candidate and an intern for the committee on Ethnicity, Immigration, and Rights. To plan for the sculpture, Figueroa said she dug into the Harvard archives to learn more about Tercentenary Theatre. “In terms of landmarking this space, not only does the installation work in the horizontal dimensions and provide a resting space, but the poles that come up also disrupt that visual line of sight and again just make it even more of a spotlight even more of a stage, even more of a landmark here,” Figueroa said. 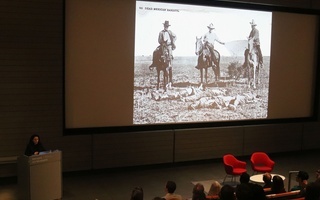 Lori E. Gross, associate provost for arts and culture, said Baldwin’s references to light made it a “very important” element of Fernández’s work. Chris Molinski, a research curator at the Harvard Art Museums, said the space brings Baldwin’s words to life. “The intention is to have a series of public conversations where we will read the Baldwin text together in this space and also using the Baldwin text in course-work, in group discussions, with student groups as a jumping off point for creative responses that will continue a conversation beyond this physical structure," Molinski said. Fernández wrote that upcoming readings of Baldwin’s essay at the sculpture are also designed to evoke a sense of “public intimacy.” She said human interaction with and around her work is a key part of the sculpture. Prior to this one, Harvard commissioned other art projects including “John Harvard Speaks,” a video installation in which the John Harvard Statue was temporarily animated with students’ faces and voices. On Sept. 14 at noon, Jonathan L. Walton, a Divinity School professor and Memorial Church minister Jonathan L. Walton will lead a public reading and subsequent discussion of Baldwin's essay at the sculpture. The art space will be open to the public and will continue to host events until its removal on October 1.